1. More Orwell from the Oregon Department of Transportation. When it comes to any public policy decision, but especially one that involves spending $500 million (and likely a good deal more), the public has the right to expect that public employees will be truthful and candid. That hasn’t been the case with the I-5 Rose Quarter Freeway widening project. ODOT staff went to great lengths to conceal the fact that their traffic projections assumed the construction of a $3 billion, 12-lane freeway crossing the Columbia River (an assumption that dramatically biased their impact analysis against the no-build option). 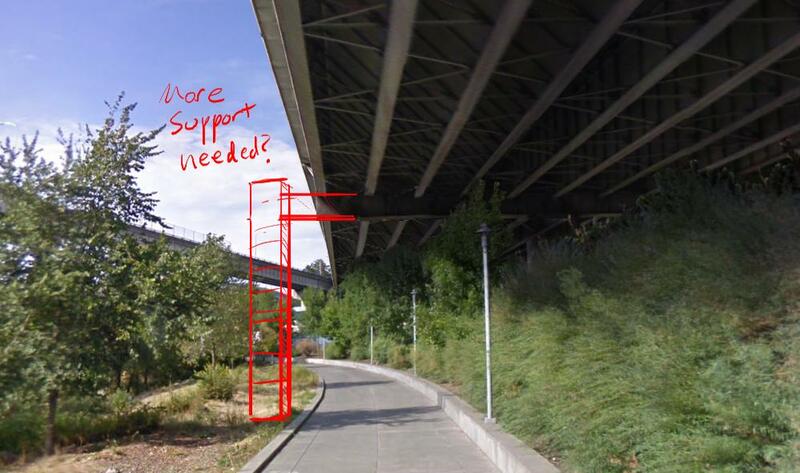 To help sell the project, ODOT presented a handful of carefully selected computer renderings to make the project appear as benign as possible, and then in response to a public request, denied that any engineering plans existed. Under pressure, the department conceded that engineering plans did in fact exist, and produced more than 33 gigabytes of drawing files. The public deserves better treatment from its servants that such blatant attempts to conceal and lie about fundamental facts about this project. 2. 25 Reasons not to widen Portland freeways. We’ve extensively analyzed the proposal to spend half a billion dollars widening a mile-long stretch of urban freeway in Portland, especially over the past month. Here’s the complete guide to the 25 different reasons why freeway widening is a bad idea, ranging from its failure to reduce congestion, the certainty that it will increase driving and greenhouse gas emissions, to its negative effect on safety and neighborhoods. This particular project will also make life worse for those who walk, bike and take transit in city neighborhoods, and is manifestly inequitable, chiefly benefiting higher income, drive-alone commuters from outside the area, while inflicting more traffic, noise and pollution on those who live in the area. 3. Integration and interaction: Evidence from Inter-marriage. One of the regular critiques of urban integration is that simply having people from different backgrounds (income, race-ethnicity) living in the same neighborhood doesn’t mean that there’s meaningful social interaction. People tend to associate more often with others who are like them, even in the most integrated places. But the evidence from patterns of inter-marriage (marriages between people from different racial and ethnic groups) suggests that residential integration is a powerful force in promoting this, the most personal and enduring form of interaction. Highly segregated cities have little intermarriage; highly integrated ones have much more. Statistically, there’s a strong correlation between integration at the metropolitan level and rates of inter-marriage, suggesting that integration does promote inter-group interaction. Integration doesn’t necessarily produce instant kumbaya, but it does seem to be a pre-requisite for greater social interactions. 1. Emily Badger on socialism for cars. New York has, finally, authorized congestion pricing for Manhattan, and to many it seems like at affront to a fundamental notion that roads ought to be “free.” But as we’ve noted at City Observatory, there’s nothing “free” about roads, especially urban roads–they’re costly to build, maintain and expand, and their value is appropriated for private use by a relatively small portion of the population that pays far less to use roads than they’re worth. The New York Times Emily Badger has an essay–“The streets were never free; Congestion pricing finally makes that plain,”–underscoring the problems that our implicit policy of socialism for cars and car storage has caused for city living and public budgets, drawing on the expertise of Michael Manville, Yonah Freemark, and others. 2. Freeways without futures. The Center for New Urbanism is back with its biennial report on freeways without futures, those urban roadways that have long since outlived their usefulness (if, indeed they had any to begin with), and which if removed, would heal and grow urban space. The experience of cities that have removed freeways is that it’s generally made urban life better and stimulated housing markets, provided public space and benefited city economies. The report hands down death sentences for urban freeways in Tampa, Dallas, Detroit, Austin and several other cities. Our personal favorite: removing Portland’s Eastbank I-5 freeway, a Robert Moses-relic occupying prime riverfront land in the city’s core. Early signs of rising prices in Opportunity Zones. The new opportunity zone law, enacted as part of the 2017 tax cut law, provides a generous capital gains tax break for investments in designated low income neighborhoods around the country. Economic theory suggests that all other things being equal, a tax cut that applies to a particular area and not others should be reflected in the value of the property–a seller would pay more for an otherwise identical property in a tax-advantaged area than one that had a higher tax rate. Economists call this “capitalization”–the value of the tax break gets capitalized into the value of the property. In practice, what that means from a distributional standpoint is that at least some of the value of the tax break is a windfall for the property owner. 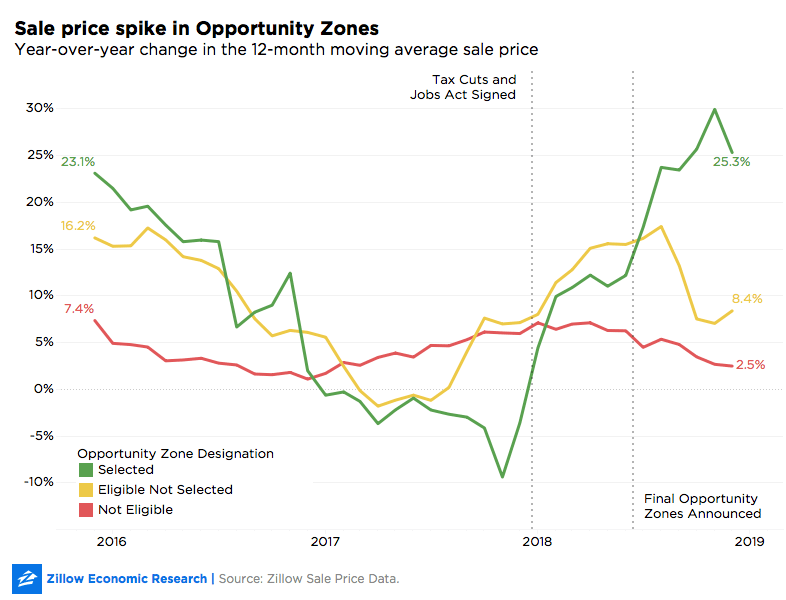 It will take a good deal of time to figure out whether, and how much capitalization is happening with the opportunity zone program, but real estate analysts at Zillow have an early read, based on their analysis of housing prices. They’ve tracked the pattern of change in home prices in opportunity zones, and compared them to other low income neighborhoods eligible to be designated at opportunity zones, but which weren’t designated. These data show that prices in such neighborhoods are more volatile than in all neighborhoods, but since the designation of opportunity zones last year, there’s been a noticeable uptick in prices in designated zones (green line) relative to otherwise eligible but not designated zones (yellow line). Again, this is fragmentary evidence and early returns, but it bears watching. 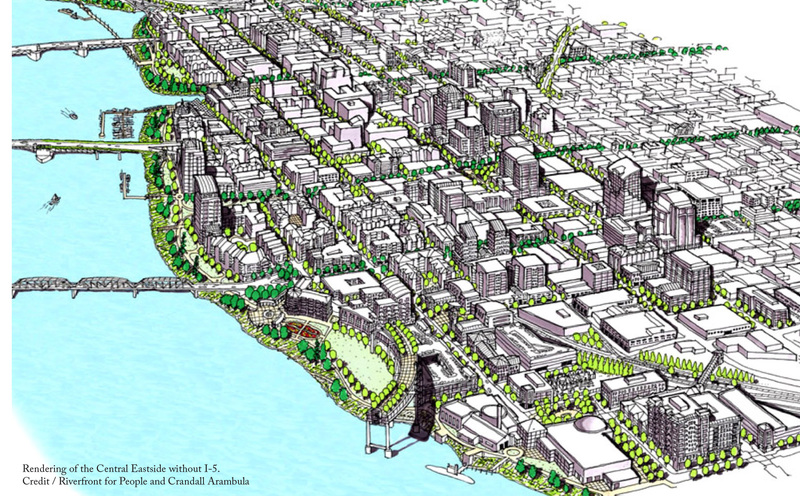 Willamette Week reported on the serial prevarication by the Oregon Department of Transportation in its attempt to sell the Rose Quarter freeway widening project, publishing project renderings showing how the widened freeway would intrude on riverfront parkland (with renderings generated from previously suppressed data). The article also cites City Observatory’s analysis showing that the freeway-widening project actually proposes to build a right-of-way that would easily accomodate an eight-lane freeway.